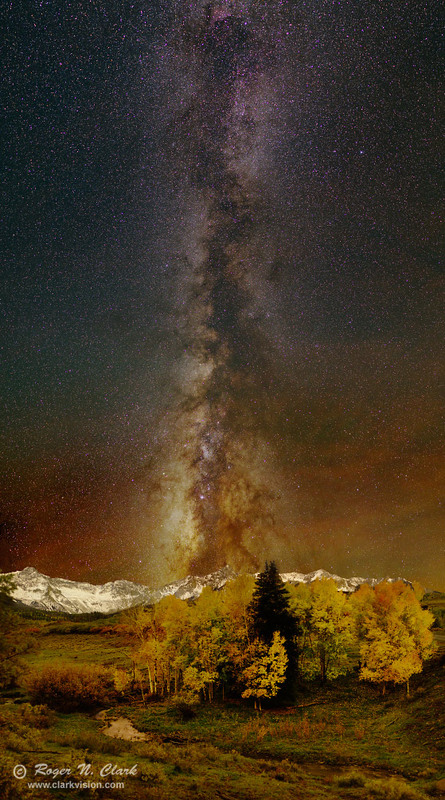 Fall Colors in Colorado, and the snow capped San Juan Mountains provide a beautiful foreground for the night sky that appears to be showing its own fall colors. This scene is all natural light. The light on the land is that from the night sky: light from stars, the Milky Way galaxy, and airglow: light from molecules in Earth's upper atmosphere excited by solar ultraviolet light during the day and from cosmic rays. The molecules emit light throughout the night. The red is typically from hydroxyl (OH) 80 to 90 km high. The airglow light is emission line sources, like that from a neon sign. That narrow-band light creates enhanced colors on the landscape, in particular greens and reds in the trees. For more on natural color in the night sky see Parts 2a, 2b, 2c and 2d on Color of the Night Sky and proper post processing to show those colors. Technical. Canon 1D Mark IV 16-megapixel digital camera, Sigma 35 mm f/1.4 lens. This is a 34-frame mosaic made at ISO 1600 and f/1.4. The landscape was 6-minute exposures with a fixed tripod. The sky was 30-second exposures, and the stars were tracked with an astrotrac. Image obtained September 30, 2013. The full resolution image is 16,100 pixels high and 8,946 pixels wide.